Whenever we are in need of a free email service we always look forward to Gmail, which is giving such amazing service from the beginning. Gmail becomes the first choice of users not because of, it is associated with Google, the reason is that it gives you such amazing features and services in free of cost. For general purpose, Gmail provides his services for free. However, if you need this service for your business then you can buy its business plan which can cost you a little bit. Firstly open/log-in your Gmail account using your google account on which you want to block someone. Once you are successfully logged into your account you need to search the person that you want to block, use the search box to search the account, by putting the email on that and hit enter. After searching the specific mail account you want to block, you will see the list of emails you got from that mail account on your Gmail. Select any of them to open the mail. On the mail area from that mail, look for the drop-down icon which you will find along with the date of receiving that email Or simply look the below image. Now you will see many options on that drop down box. Select the Block User option, here the User word will be the username of that person/account of Gmail. After clicking the Block User option you will see the confirmation box, Click on Block button on that. After following the all above steps you will no longer receive the emails from that user you just blocked. If you have such list of spammy emails or account then you can follow the same for all. 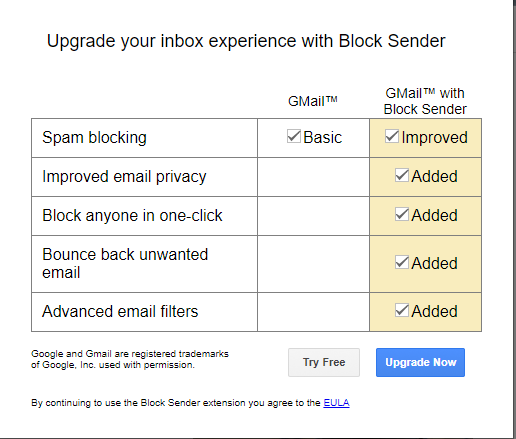 Unfortunately, there is no option of Batch blocking so you have to follow all the above-given steps for each of them, in order to block those accounts from that particular Gmail account that you are logged in. Open your chrome browser and if you already using it then its good. Visit this link and Click Add to Chrome button. The Blocked Sender will be activated after that. Open your Gmail account and follow above method to search and open the email of that particular person who you want to Block. On the email page, you will see the new Block button above, along with all the usual options or buttons such as Archive, Report Spam, or Delete. Click Block button and the email account will be blocked right after that. Note: By using the extension to block Gmail account you get the authority to block an account or multiple accounts manually using Block button. Also even after removing the extension from your chrome browser the particular account on which you have performed the blocking action will remain blocked. 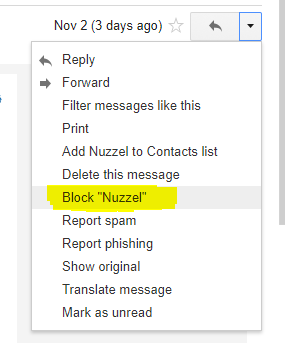 Got any question regarding how to block someone on Gmail ? feel free to ask in the comment section below.